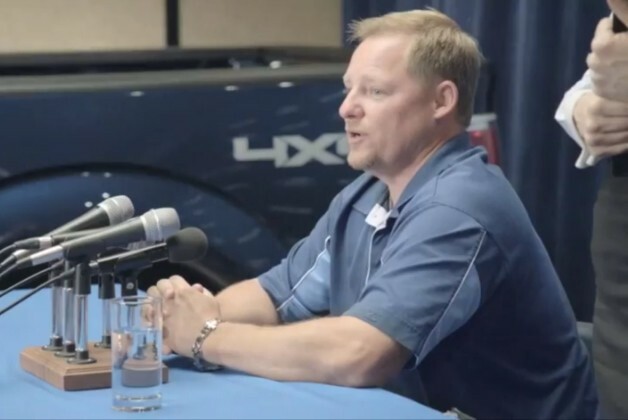 Ford has pulled its controversial "Drive One: Press Conference" ad starring owner Chris*, who offered negative commentary of the government-sponsored bankruptcies of crosstown rivals Chrysler and General Motors when asked why he chose to buy a Ford. You'll recall that Ford and its CEO, Alan Mulally, was – and continues to be – publicly supportive of the auto bailouts. While it seems a bit incongruous to both be supportive of the bailouts and to use them as a marketing point to help sell cars, you'd think Ford would be able to do as it pleases with its advertising – especially considering it didn't succumb to bankruptcy and take a government bailout (though it did accept many millions of dollars in low-interest loans and tax breaks). Still, says The Detroit News, it was pressure from inside the White House that finally got Ford to yank the bailout-critical ad. Of course we needn't remind you that talk of re-election and political campaigning is all the rage these days... well, we guess we just reminded you anyway. In any case, something tells us that Chris, the star of the advertisement, won't be too keen on seeing his message fall by the wayside in this manner. And, judging by the results of our completely unscientific poll, the majority of our readers don't think Ford did anything wrong in the first place and therefore probably shouldn't have pulled the ad.